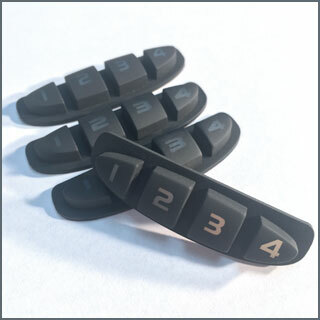 AGE Nameplate offers customer-specific Silicone Rubber and Polyurethane Elastomer Keypads in any color, with silk-screened or etched text and symbols, carbon-pill actuators, and epoxy coatings for rock-solid durability in industrial applications. We begin with your 3-D solid model and 2-D mechanical spec. 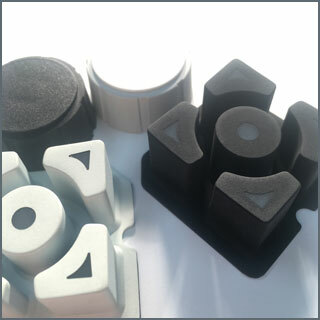 The tooling and molding process typically produces first article samples in 4~5 weeks depending on complexity. Once the 1st articles are approved, we’ll have your production order ready in about 4 weeks. What could be more simple? For water-tight applications, contact our sales engineers. We have the experience you need to help guide you through the design phase. 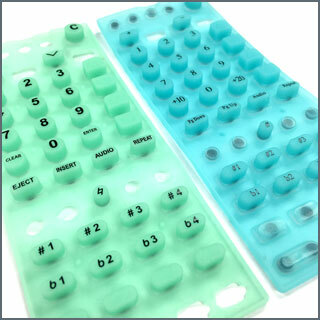 The heart of technology at AGE Nameplate: An innovative spirit and a “can do” attitude are the driving forces that have engineered thousands of custom Elastomer Keypads over the past 40 years. Go ahead, push the envelope: Nothing is too complicated for us!